Rashtrotthana Trust was established on 1st August 2003 through a Trust Deed and has the experience of running projects like Sandeepana Vidya Bhavan, Srirampuram, Bangalore and Jnana Bharati Vidya Mandira, Chitradurga. Rashtrotthana Trust has exemption under section 12A (a) and 80-G recognition under the income tax act. An MOU between Rashtrotthana Trust and Rashtrotthana Parishat was signed on 1st April 2018. As per the MOU, Rashtrotthana Parishat will be handing over the management, administration, running and maintenance of its service projects named as TAPAS, SAADHANA, SAMRAKSHA and JAAGARANA to Rashtrotthana Trust in April 2019. Rashtrotthana Trust has the necessary technology, skill set, manpower and network to look after the management, administration, running and maintenance of the above mentioned service projects. It has the capacity for the efforts required for their efficient and smooth functioning and to comply with all the obligations cast upon such services by the Government, local bodies, donors, sponsors and other stake holders without any compromise or letup. Rashtrotthana Parishat has set up all the infrastructure facilities for the said service activities including buildings, equipment, machinery, furniture, vehicles and other such assets and has handed over the same to Rashtrotthana Trust for their utilization for the efficient operations of the above mentioned activities. Further, the above mentioned infrastructure facilities have been handed over without any cost, fee, rent, interest or obligation to Rashtrotthana Trust by Rashtrotthana Parishat. RashtrotthanaParishat has also undertaken to take care of any further additional infrastructure requirements, replacement or enhancement as may be required from time to time. No fees or charges of any nature are charged by Rashtrotthana Trust on the beneficiaries of the said activities. Rashtrotthana Trust has to raise funds required for the day to day management and operations of the said activities including the upkeep and maintenance of the infrastructure provided by Rashtrotthana Parishat by way of donations, sponsorships, grants, contributions from individuals, corporate, Govt/Semi Govt agencies etc. 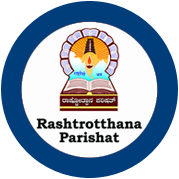 All the activities carried out by Rashtrotthana Trust, all literature, electronic media, publicity material, correspondence or other such documents in public domain carries the name and emblem of Rashtrotthana Parishat as the principal sponsor.